Published: Mar 3, 2016 · Modified: Apr 12, 2019 · By Jen Sobjack · This post may contain affiliate links. 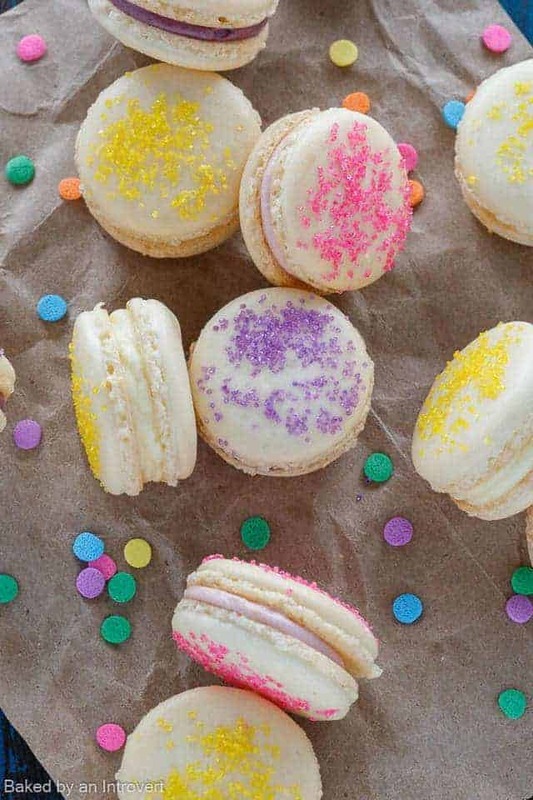 Surprise your family and friends with these homemade Easter Cheesecake Macarons. 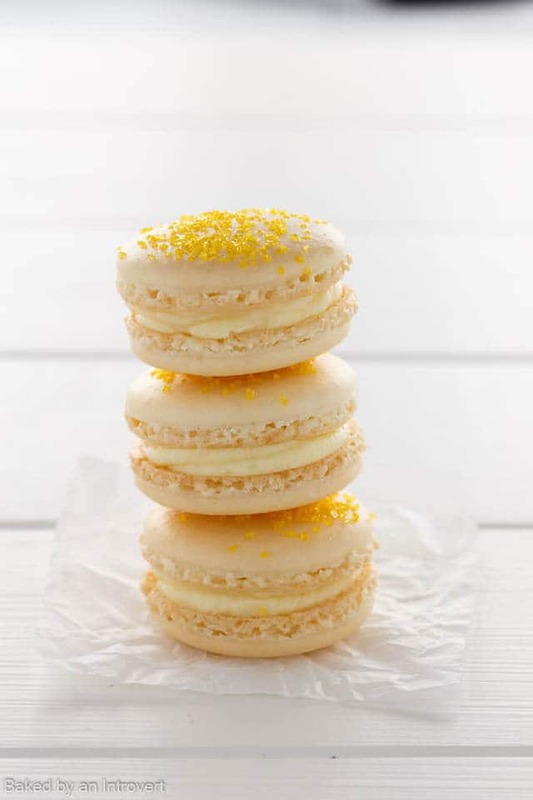 Crisp and chewy French Macarons sandwiched together with your choice of fruity Cheesecake filling. Lemon, strawberry, and blueberry cheesecake flavors offer colorful fillings that are perfect for Easter. Each shell is decorated with color-coordinated sugar crystals to match the filling. My basic French Macaron shells are filled with three different cheesecake flavors. There’s tangy lemon, bright strawberry, and utterly delicious blueberry. Macarons are a tad bit finicky and require precision and a delicate hand. You can read all about my tips for achieving success in my macaron tutorial. Start a new Easter tradition by making these fun, colorful macarons for your family and friends! Today’s macarons are inspired by Easter and pretty spring colors. Just look at the pink, yellow, and purple fillings. They make me so happy! Back when I was growing up we dyed Easter eggs the night before, woke up early for the sunrise service at church, and came home to unwrap Easter baskets filled to the brim with candy. As an adult, I don’t have any Easter traditions. I’m not religious and I don’t have kids to do the whole Easter basket thing with. So for me, it’s just another day really. I don’t eat much candy but I do get excited about baking fun Easter-themed treats. What about you? Do you have any Easter traditions? I’d love to hear about them. 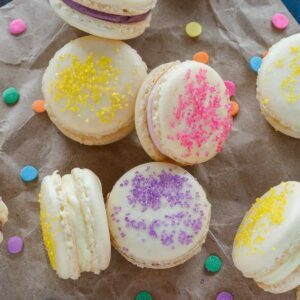 If you are like me and don’t particularly celebrate, you can still make these oh so yummy cheesecake macarons! They are a wonderful treat for adults and kids alike. It does require technique and precision to master these delicate almond cookies. But you can absolutely do it. I mean if I can do it, you can totally do it! Read over the tutorial I linked above in the recipe highlights and follow those instructions to make the macaron shells. Remember to weigh all your ingredients and use a high-quality almond flour. My favorite is Bob’s Red Mill. 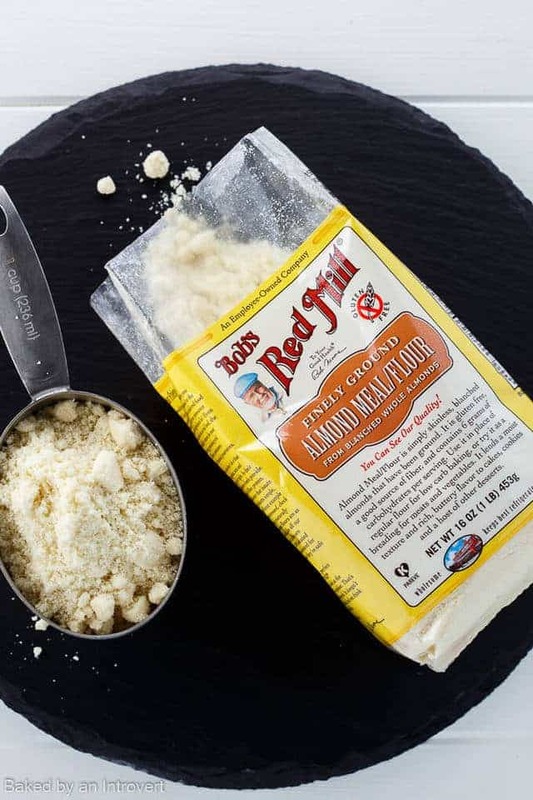 Bob’s Red Mill Almond Meal is ground from whole, blanched sweet almonds, which are full of protein. 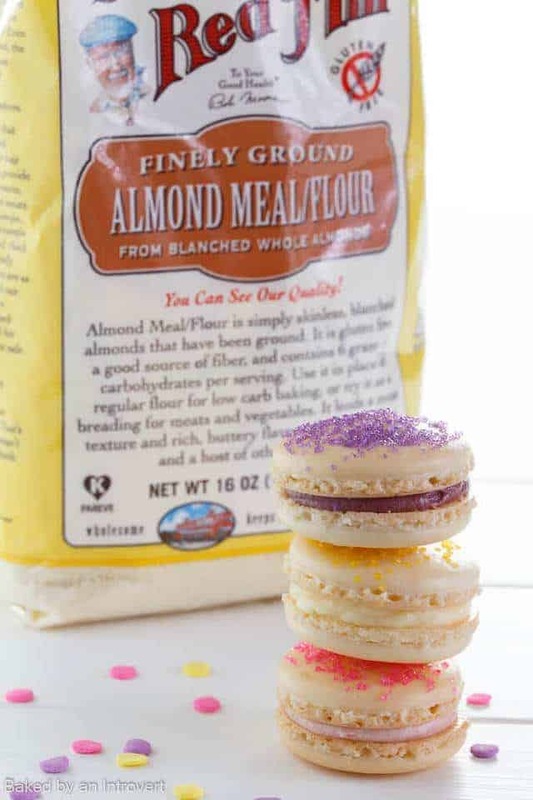 The almond flour is also very low in carbohydrates and inherently gluten-free. Once you have made the batter and piped out rounds, sprinkle some colorful sugar crystals on top. Do this while they are still wet. As they bake, the crystals will adhere to the cookie. I chose sugar crystals that matched the filling colors. The cheesecake filling is my favorite part about these macarons. It’s not overly sweet and compliments the sugary shells perfectly. All I did was divide some softened cream cheese into three parts and add a different flavor of jam to each one. I went with lemon, strawberry, and blueberry. The lemon was my favorite out of the three. I’m absolutely hooked on making macarons now! They offer such a unique texture with the crisp, chewy shells and cool creamy fillings. Simply to die for! Crisp and chewy French Macarons sandwiched together with your choice of fruity Cheesecake filling. Lemon, strawberry, and blueberry cheesecake flavors offer colorful fillings that are perfect for Easter. Each shell is decorated with color-coordinated sugar crystals to match the filling. 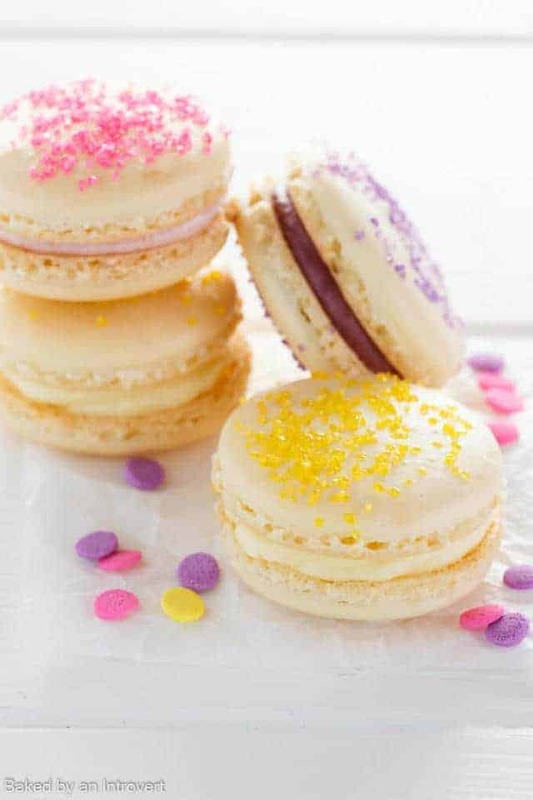 Surprise your family and friends these homemade Easter Cheesecake Macarons. Prepare the French macaron shells according to the recipe instructions. 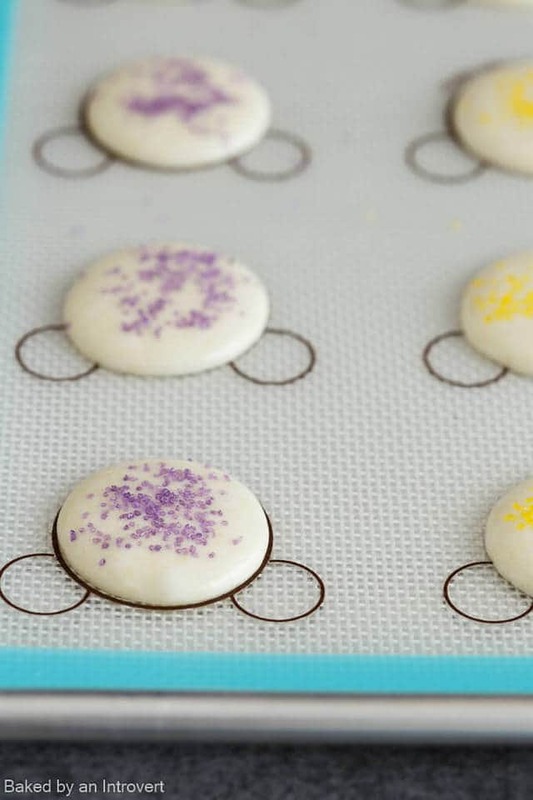 Sprinkle the piped mounds with your choice of sprinkles immediately after piping, while they mounds are still wet. Bake as directed and cool completely. Divide the cream cheese into 3 equal portions. Place each portion in its own bowl. Add the lemon curd to one, the strawberry jam to another, and the blueberry jam to the last one. Mix each bowl of cream cheese and jam until well combined and free of lumps. Place each filling into its own sandwich bag and cut off a tiny bit of the bottom corner. Squeeze a small about of filling into the bottoms center of one cookie, don’t go all the way to the rim. Place an equal size cookie on top to sandwich the filling. Repeat with remaining cookies and filling. Store the macarons in the refrigerator overnight and bring to room temperature just before serving.